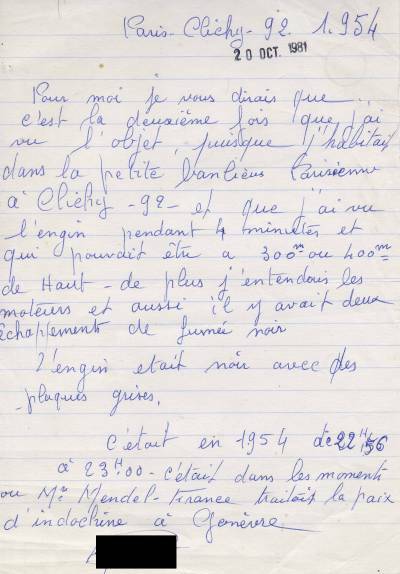 Reference number for this case: Jul-54-clichy. Thank you for including this reference number in any correspondence with me regarding this case. I would like to report to you that resising Rue de la Paix at Nr. 12 on the 3rd floor, that my spouse while I looked at the TV, beckons to me to come to the kitchen and we saw from the kitchen balcony at approximately 10:25 p.m. yesterday is i.e. Sunday evening the 01/18/81, a flying object of an orange red color very bright of the size of a full moon, appearing twice and spitting almost certainly smoke which was white and remained on the spot during 2 minutes then left slowly towards the South-east towards Switzerland, since we saw it in the East maybe above the ILLE [Ile] Napoléon - Rixheim and disappearing at about 10:43 p.m. I give you this confirmation in full certainty in addition I rang at neighbors' but unfortunately there was nobodies in the street. We are three people to have seen this phenomenon. I wish that perhaps of other people is seen it and that they they also reported it to you. The craft was black with gray plates. Pierre Mendès-France, then chief of the French government, had announced to have concluded agreements from pausing the hostilities in Indo-China by a speech at the French National Assembly on July 22, 1954. This is why, according to indications of the witness, I date his sighting in July 1954. The negotiations however began at the end of the April 1954, my date is thus relatively arbitrary. The witness is not anonymous; his letter is signed, his address indicated. However it was perhaps not his wish that his identity is revealed, when he wrote his letter, therefore I masked it. The places of his observation with Riedisheim are extremely familiar to me. Although I do not know the witness, I lived not far in my youth between 1970 and 1984. It is possible that the sighting was the passage of plane, frequent on the indicated place, and having caused a certain number of sighting reports in this same sector during years. The thing was perhaps not exactly as large as full moon and the strong luminosity might be the landing lights in low flying approach of the two nearby airfields. The sighting in 1954 irrestistbly makes think of some plane too, but the data is not sufficient to be certain. 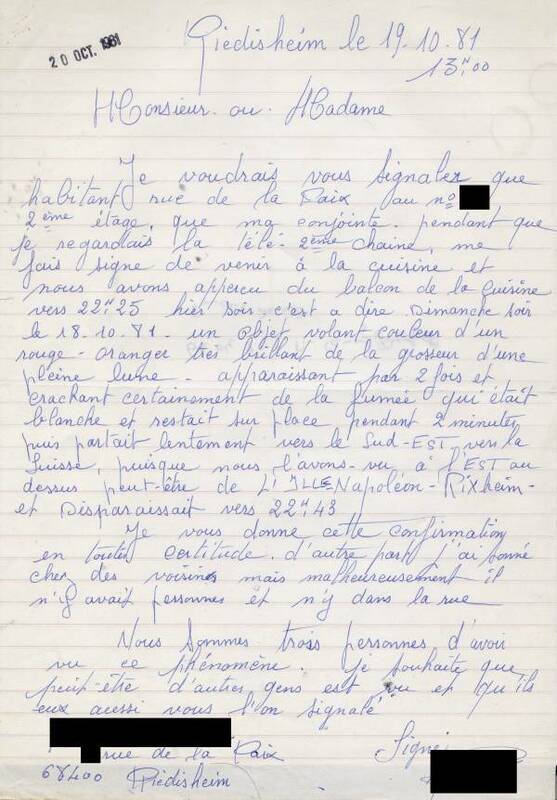 [lt1] Witness letter to a ufologu association in Mulhouse, original copy with witness name in my filz, OCtober 19, 1981.